Have you ever wanted a beautiful smile filled with uniform, straight teeth but were reluctant because you didn’t want traditional metal braces? There are some advantages to metal braces, but there are many disadvantages as well. Metal braces hurt–they can cut and scar your gums and the inside of your mouth. Metal braces aren’t the most attractive option. They also seem to take a long time to give you straight teeth. Is there an alternative to metal braces to give you straight teeth? Yes! The answer is ClearCorrect clear braces. What are ClearCorrect Clear Braces? 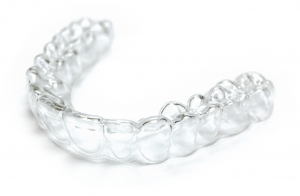 Simply, ClearCorrect clear braces are plastic custom made trays that gradually but consistently give you straight teeth but without the hassle associated with traditional metal braces. We provide these clear braces at our Derry NH cosmetic dentistry office near Windham NH and Londonderry. Why are ClearCorrect Clear Braces to get straight teeth so amazing? ClearCorrect clear braces are clear, so you can smile and laugh while you transform your crooked smile into straight teeth. Go ahead, have your photo taken. Nobody in the Windham NH area will know you are wearing braces. ClearCorrect clear braces have no metal wires or brackets, so they won’t cut or scar your gums or the inside of your mouth. Because ClearCorrect clear braces are removable trays, so it is far easier to keep your teeth clean. You simply remove the trays and brush and floss as you normally do. With the ClearCorrect clear braces, the trays are switched out every two weeks. This means that the process to get straight teeth is gradual but consistent. There may be slight discomfort when you put in the new trays, but most of our patients at our office near Londonderry say it is nothing compared to the pain of getting the wires tightened with traditional metal braces. When you come in for a check up, the Derry NH dentist will usually give you several sets of ClearCorrect clear braces trays, so that means fewer visits with us. This saves you time. ClearCorrect clear braces usually take less time to give you straight teeth than the traditional metal braces system. If you are ready to get the smile you’ve always wanted, call our office serving the Londonderry, Windham NH and Derry NH today and we will partner with you to see if ClearCorrect clear braces are right for you.